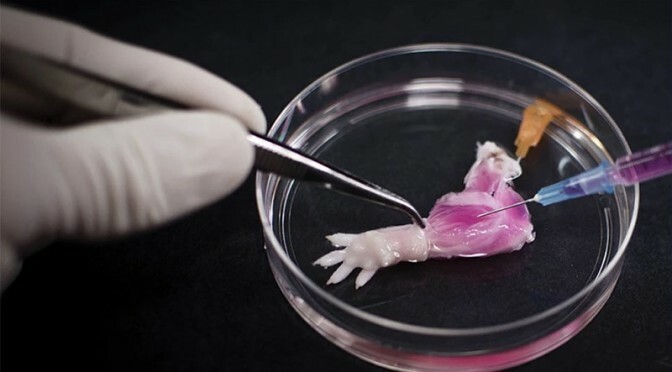 Scientists Grow First Bio Rat Limb In Lab - MetaModern Magazine, The Voice of Our Digital Meta Modern Culture. Scientists at Massachusetts General Hospital (MGH) in Boston have grown the fist bio rat limb with veins and muscles. According to the findings from MGH, the scientists believe this is one of the first steps towards developing bioartificial replacement limbs that could be used for human transplantation. Harald Ott, MD, senior author of the findings and MGH Department of Surgery and the Center for Regenerative Medicine and Assistant Professor of Surgery at Harvard Medical School, the biological nature of our limbs makes building a functional biological limb replacement a challenge. “Limbs contain muscles, bone, cartilage, blood vessels, tendons, ligaments and nerves – each of which has to be rebuilt and requires a specific supporting structure called the matrix,” said Ott. So the key for transplantation is regeneration. The cells must regenerate all of the tissue surrounding the limb, and to do that you need something to build that on so the cells can grow into the right tissues surrounding and supporting that limb. “We have shown that we can maintain the matrix of all of these tissues in their natural relationships to each other, that we can culture the entire construct over prolonged periods of time, and that we can repopulate the vascular system and musculature,” says Ott. The scientists created the artificial limb through a decellularization process where living cellular material was stripped from forelimbs of dead rats so the vasculature and nerve matrix was in tact. Scientists then removed the cellular debris, which is what’s left over after a cell dies, and created a cell-free matrix. The cell-free matrix functions as a type of scaffolding or bio structure for the limb’s tissue to grow on. At the same time, muscle and vascular cells were grown in a culture. The limb was suspended for five days in nutrient based culture and then scientists applied electrical stimulation to facilitate muscle formation. After 14 days, they removed the bioartificial limb from the bioreactor. The findings showed the muscle cells and cells on the blood vessel walls were linked with the right fibers throughout the muscle matrix.